Farmstand Asian Slaw, originally uploaded by chrisfreeland2002. I was inspired to make this slaw after reading this article in Food & Wine about quick pickles. I like to make pickles & relish, but generally process them in a waterbath; these are faster to make, but more perishable. The beauty of making relishes like this is you can throw in whatever you have on hand or looks good at the market and then find the appropriate seasoning to mix with the veggies. 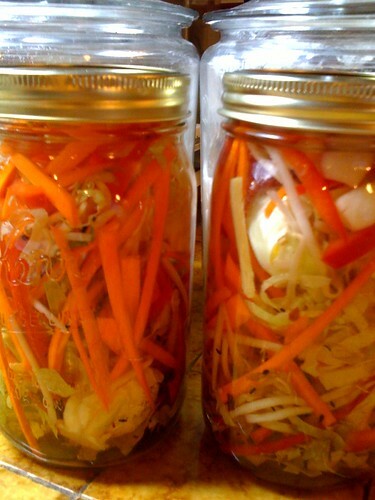 At the Tower Grove Farmers' Market on Saturday I found really crisp cabbage sprouts, bean sprouts, carrots & red peppers, so I started thinking about an Asian slaw, plus I knew I had garlic, ginger & rice vinegar on hand. Talk about simple - I washed & chopped all the vegetables into thin strips and placed them in 2 qt jars, and topped them with the Curry Quick Pickles brine recipe. This should keep for a month in the fridge. I tried it out this morning and the flavors are already there - tangy, sweet, salty, & peppery with a satisfying crunch from the fresh veggies. A more zingy title for this might be "Country Kimchi" but since it doesn't have fermented cabbage it's not reeeeeally kimchi, so I didn't want to offend any purists.